During E3 2018, I was lucky enough to be able to try out Creed: Rise to Glory, which I found to be one of the most realistic VR experiences out there so far. 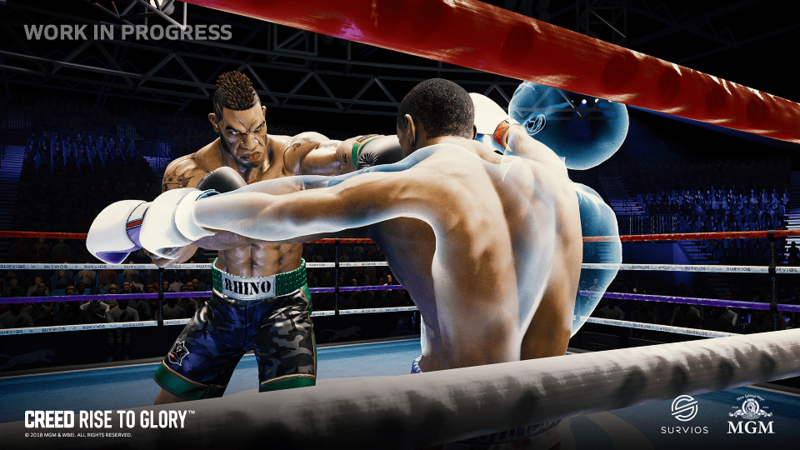 I was subsequently able to grab a few minutes with Kim Marlis, the producer for Creed: Rise to Glory, and talk with her about developing the game, Survios’ relationship with MGM, and how they made this game such a realistic boxing experience. You can visit Survios at their website, like them on Facebook, tweet them on Twitter, subscribe to them on YouTube, and follow them on Instagram. You can also check out my hands-on impressions of Creed: Rise to Glory at E3 2018 here. Kim Marlis: My name is Kim Marlis, and I am the producer for Creed: Rise to Glory at Survios. Boxing has never looked or felt as realistic -while still being fun- as in Creed: Rise to Glory. (Image courtesy of Survios). OR: So what is Creed: Rise to Glory? 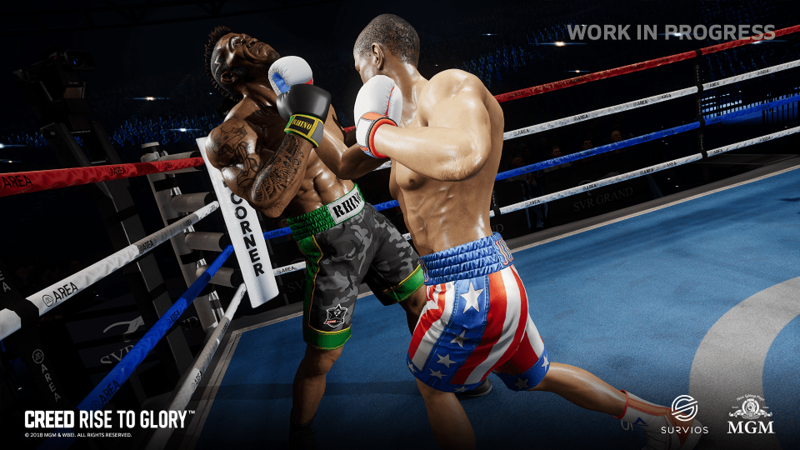 KM: Creed: Rise to Glory is a cinematic boxing experience based in the Creed universe. We were approached by MGM- they wanted to make a real boxing game. Something that actually was visceral and actually taught proper boxing techniques and wasn’t just ‘memorize a sequence and you can beat the opponent.’ And we came up with Creed. And the reason that MGM came to us was that we were able to figure out different solutions for all of the difficult transitions with the new technology of VR [such as] motion sickness. There aren’t – at least that I’ve played- any VR boxing games that actually feel like you’re connecting with something. It feels like you’re kind of just failing and slapping and doing all of that stuff, and that’s not what we wanted. We wanted, obviously, a game that’s fun, but we really, really wanted people to have to think about what they’re doing. Maybe worry about stamina and blocking and how different enemies are going to have different pros and cons [to fight] and things like that. So we figured out a solution for actually being able to feel like you’re connecting with something, and that is our ‘Phantom Melee’ technology. Big, long word for pretty much just tricking your brain into thinking [that] you’re hitting something. And you know that as you played yesterday, you’ve got your two avatars- you’ve got your one-to-one avatar with your hands and then you have your boxing avatar with the gloves. When your stamina gets really low, you’re swinging at a normal speed, but your gloves are lagging behind just like [they] would normally do if you’re quite tired during a fight. So that, coupled with tactics and tricking your brain so it ‘stops’ on the opponent – your hands are going to go through, but after a couple of hits, your brain is going to start not punching all the way through, but just feel like you’re hitting something. It’s a really, really cool ‘loophole’ in VR, and my team crushed it on this one. I’m really proud of them. And that’s when we came up with this demo. And this demo has only been two months in development. We’ve obviously progressed so far, and I can’t wait for everyone to see the cool game when it comes out. OR: You mentioned that you used realistic boxing techniques. Was part of your staff already well versed in how to box, or did you bring people in- or what did you do? KM: A bit of both, actually. And we’re getting boxing classes every Tuesday for all of us. I was unable to walk for an entire week after it, but it was amazing because we’re having boxing instructors come in. We wanted to make sure that our training montages [and] our actual feel of the opponents and the way that we have the player punching was gamified, but it actually makes you learn things. And you’re learning proper boxing, so you can go to a boxing class and you [can go] ‘okay, I know my stance, I understand what a hook is [and] what a jab is, I know how hard to punch’. It’s just very cool, and everyone that we’ve brought in to play this and give feedback has been a tremendous success, and we’re still doing it. We want to make sure that all through development, from beginning to end, that we have as much outsider opinion -especially professional opinions- we have some MMA fighters to get some information from, they are coming in, and hopefully we’ll get to mocap some of them. So we’ll still see on that. But it’s all the fighters that have been coming in have been ‘this is actually a proper boxing game.’ I’m like ‘This is so cool!’. It’s really exciting. OR: You mentioned that MGM was the one that helped to bring [Creed: Rise to Glory] about. How involved had they been with the day-to-day, since you’re managing their franchise? KM: They’re very hands-on. They’ve been a wonderful partner. There’s obviously a ‘me’ version of me over there that is my point of contact, and we talk pretty much all day every day to make sure that things are on point with approvals and if there is anything they need from us, we can get it to them quickly. It’s been a really, really positive experience working with them. I would absolutely, absolutely continue to work with MGM now and in the future. 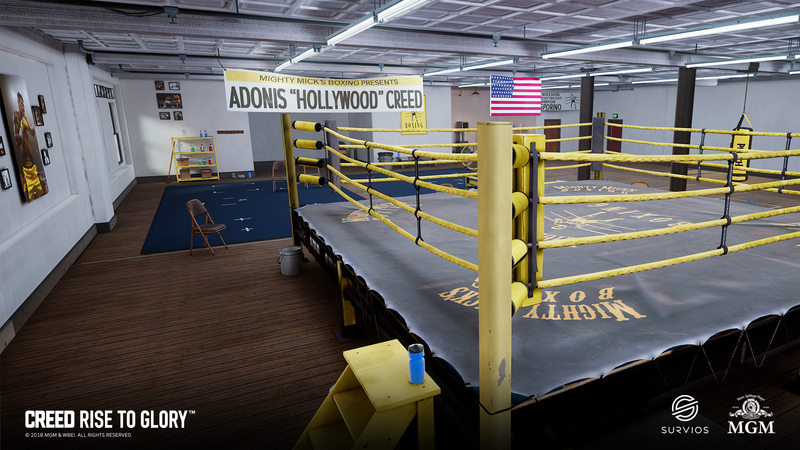 OR: I demoed [Creed: Rise to Glory] yesterday, and I noticed that there wasn’t VR locomotion in the demo to let you move around the boxing ring. Was locomotion or room scale VR explored for this [game]? KM: Yes. And it will be in the final game. So we actually have locomotion – it’s pretty cool. I can’t go too much into it, but we absolutely have full locomotion in the final game. Like you’re actually able to maneuver around the ring and so you’re not just [stationary]– again the demo was made over two months, and we’re just doing a ton of R&D, because it needs to be done right. And that’s something that I am really enjoying about Survios. Everyone here is the top of their game. They’re the best of the best, and they only want to put out a product that we’re completely proud of. And that includes all of the tech that we have in each game. So we worked very, very hard – we had a few engineers dedicated to just figuring out the best direction for the locomotion, and we’ve come up with a very interesting and very usable solution. And so I’m excited to see what you all think when it comes out. OR: Is this a full-length game, or this is this more like a PSVR/Oculus Rift experience like Spider-Man: Homecoming was or VR Worlds? KM: Absolutely a full game. There’s a full career and story mode as well as what we’re calling ‘exhibition mode’, so you can select any opponent and any arena that you’ve unlocked through career progression. So there is a tremendous amount of replayability in this. We wanted to make sure that our users get the most bang for their buck. People are spending their hard-earned money on our product, we wanted to make sure they get their money’s worth. They know that that Survios is on their side, wanting to give them a great experience. What a lot of the big companies can sometimes do, we never want to be that way [for] we always want to be for the consumers. We’re gamers, we want to make games that everyone loves that we’re super proud of. OR: At the beginning of the [Creed: Rise To Glory] demo, there was a training montage with an older Rocky that looked fairly realistic to Sylvester Stallone. Was that a photo-realistic 3D scan rendition of him? KM: It was not. We modeled that after referenced images, and it was approved by Mr. Stallone. So yes, everything has to be approved by talent on this. We’re doing it right by all parties. We’re making sure that everyone that is part of this project has their say, especially when it comes to talent. 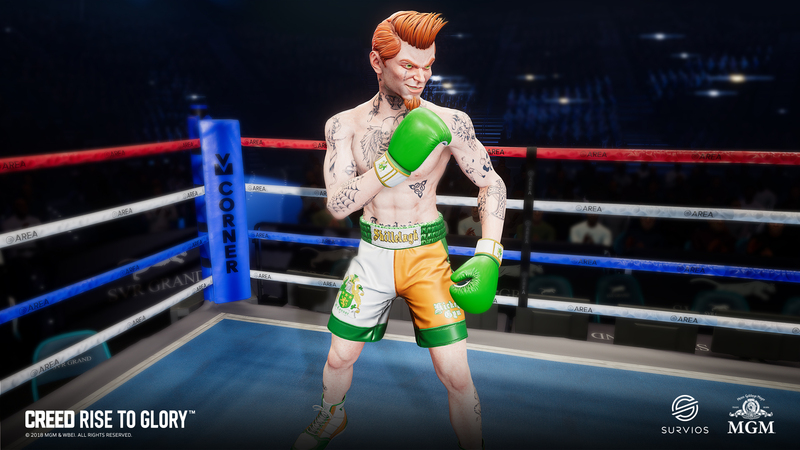 OR: How do you balance making this realistic boxing while keeping it accessible to people who may not be well-versed in VR or are new to the genre? KM: Well, we have for the full product a good deal of tutorials – again there’s going to be multiple training montages. [Creed: Rise to Glory is has], especially in the early stages of career mode, a lot of accessibility to people that have never even put on a VR headset [before]. And that’s what we want to make sure that we did. We wanted to make sure that we’re accessible to every gamer possible. For instance, I think it was Tuesday [of E3]- a gentleman played who was blind. And using audio cues and my project champion/lead engineer Eugene [Elkin] giving some cues like ‘Okay, he’s blocking now, go do this’, and the guy totally KO’d his opponent and had an absolute blast. And I was so excited when I heard about that. The other one was that you could play this sitting down as successfully as you can sitting up. And so people who are unable to stand for that long or are wheelchair-bound, they can play it and have the same experience as a fully able-bodied person. And that was something that, again, [made] me extremely proud of my company. We want to make sure that everyone gets to play our games and have the same applicable experience. OR: What platforms is this coming out for? KM: It is for PlayStation VR, Oculus [Rift], and [HTC] Vive. And we’re looking at an end of September release. OR: Just in time for the movie [Creed II]. OR: Are there any differences between the platforms? KM: The one big difference is that PSVR has some exclusive content, and that is a Rocky Balboa – Rocky “The Italian Stallion” Balboa from Rocky I– that you’re able to play against in exhibition mode. And that is a PlayStation VR exclusive for the first three months. And so it’s really cool. There are a multitude of arenas to box in in the final game. (Images courtesy of Survios). OR: I have to ask- will Ivan Drago be returning from Rocky IV? OR: To someone who may have seen [Creed: Rise to Glory] for the first time at E3 and is thinking about picking it up, what do you have to say to them? KM: Have a bottle of water handy and a towel, because it is very good exercise. But just have fun. It’s such a- honestly, everyone who has picked it up, even people who are not experienced in VR or are intimidated by an active boxing game like this, every single person who has picked it up has been like ‘okay, I take it back, this is not only a lot of fun, but it is easy to get.’ It’s a very straightforward game that as you progress, there are layers of complexity on it. Who do you want to see enter the ring? 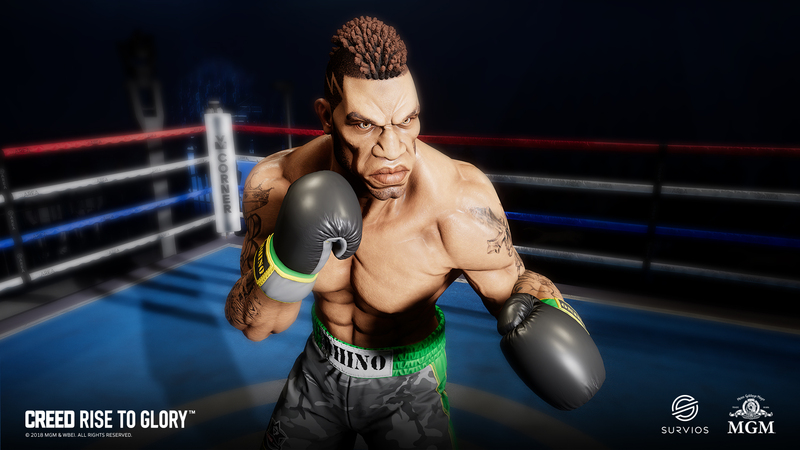 Are you excited to learn realistic boxing in VR?